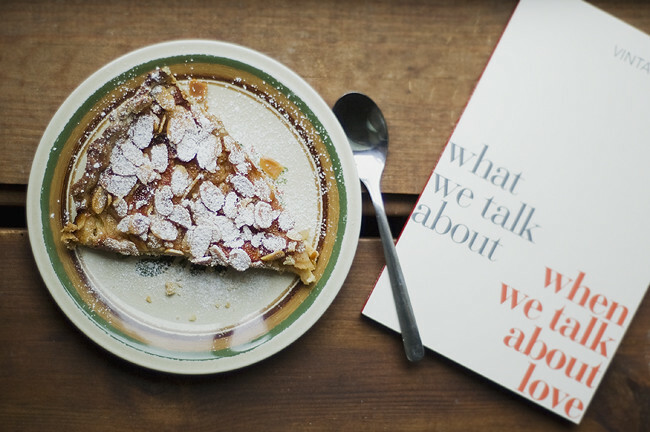 Apple/almond/cheesecake pie + current read. do you like this book? recently i reading often. now haruki murakami 1Q84. and second question! do you have an expensive books in sweden? Det där ser fantastiskt gott ut! oh my god, where do you find recipes for these goodies? åhh så gott. och fint. Delicious! Is it a good book? jill: det var det verkligen, det får nog bli min nya favoritpaj! dana: this came from a book about pies that leo got for his birthday. usually I don't like recipe books at all, but this one is actually really good! clara: this one is the first of his books that I've read, but I'm pretty sure I'll read his other work as soon as possible :) and oh, you should, recommended-books-posts are the best! Åh din blogg är alltid lika fantastisk att kika igenom! That pie looks absolutely amazing. Loving this simple shot! that pie looks incredible. i will be checking out that book. there is nothing better than curling up to a good read. That's one of my favorite books ever. I just made a list of my favorite books (here - http://bedtimemonsters.blogspot.com/2011/07/things-to-read-my-favorite-books.html) and we seem to have such similar tastes. You can't go wrong with Carver and Murakami! Scrumptious! Food for the body and food for the soul (books can be so nourishing, I think). Raymond Carver is the best - melancholic but often very insightful about the lives people lead. Hello! I have recently been given a Zenit-B for my birthday and I am really inspired by the stunning photos on your blog :) do you happen to have any tips or tricks for a complete film newbie like me? I am very interested in art but unfortunately, I am a perfectionist and don't want to ruin lots of rolls of film... Thanks! Annie: Åh, tusen tack. Kan bara säga samma sak om din hörna här i bloggvärlden! dracy: Thanks for the link, I will definitely check some of those books out! Annie: Oh, thank you! I'm not really sure if I have any tips or tricks, but take your time to get to know the camera properly and make sure not to use too outdated film :) If you in the future have some more specific questions about it, feel free to ask! Åh, jag dör en smula varje gång jag kikar in på din blogg. Så fina bilder!